NEWPORT BEACH, CA—Following the Lakers shooting guard’s surgery to repair a torn Achilles tendon, Kobe Bryant’s family and friends told reporters Friday that they are really looking forward to spending the next nine months with the NBA superstar as he recuperates from the season-ending injury. “I honestly can’t think of anyone else I’d rather spend multiple hours a day with for the next year than Kobe Bryant,” Shaya continued. With Bryant facing a strenuous post-surgical recovery, the people close to the Lakers captain reportedly voiced their unfettered enthusiasm about spending quality time with the future Hall of Famer in the coming months. Bryant’s agent, parents, personal assistant, and two daughters, who described themselves as “unbelievably lucky,” confirmed that they couldn’t wait to “just hang out” with the hobbled All-Star and enjoy “delightful” activities such as preparing meals for the shooting guard, running his errands, and making conversation with him during his extended downtime. 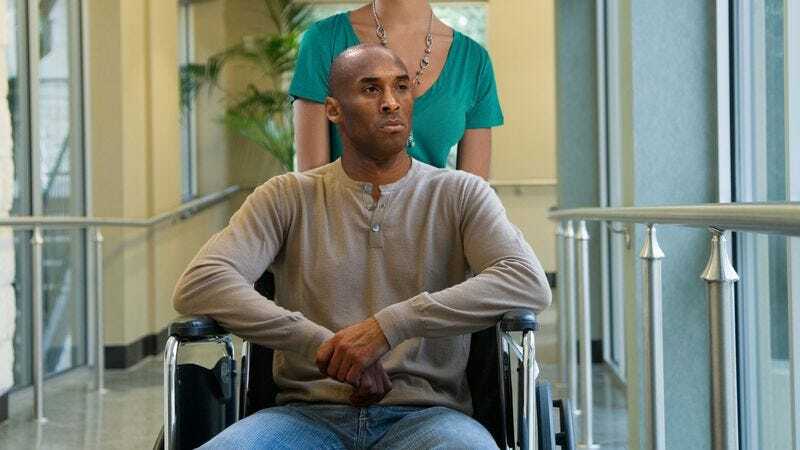 Family and friends expressed their elation at perpetually tending to the injured Lakers star’s every need as he recoups from his tendon tear, rejoicing over the opportunity to take Bryant to doctor’s appointments, help him up and down the stairs of his Newport Beach mansion, and guide him through his physical therapy exercises. While family and friends admitted that the assistance would be physically and emotionally grueling, they said that Bryant would doubtlessly show his appreciation for their tireless efforts. “That’s just not the Kobe I know,” Howell continued. Though Bryant’s recovery period will reportedly allow many people in his life to experience the pure bliss that reportedly comes in basking in his presence, none stand to benefit more than Bryant’s wife, Vanessa, who said that her husband’s lengthy convalescence would provide her a unique opportunity to reconnect with the man who has played such a special role in her life. “It’s really going to be something else,” Vanessa added.